Rachel Berry, over the course of 38 episodes, has set her romantic sights on five different gentlemen: Finn, Puck, Will, Jesse, and Blaine. She is introduced immediately as someone who wants a strong male lead both in the Glee club, and as well in her life. But Rachel-in-love causes issues with her characterization - issues that sometimes the writers are able to sidestep, and sometimes issues they just step right in. The fulfilling part of Rachel-in-love is the notion that Rachel is able to attract a guy’s attention, despite being the School Loser. That was the original appeal of Finn and Rachel as a couple - that the underdog misfit could turn the head of the star quarterback. The Pilot establishes that Rachel thinks Finn doesn’t even notice her - it’s a classic construct for a rewarding payoff in getting these two together. Of course, after having four other quasi-love interests (and also because she’s played by the lovely Lea Michele), it becomes harder for us to see Rachel as someone who couldn’t get a guy. But originally? That’s the reward of Rachel having a boyfriend, and a popular one at that. Love is hard for us. We look for boys we know we can never have. Mr. Schue is a perfect target for our self-esteem issues. He can never reciprocate our feelings which only reinforces the conviction that we’re not worthy of being loved. Trust me. I’m a cautionary tale. You need to find some self respect, Rachel. Get that mildly attractive groove back. Even so, Rachel’s early experiences with love weren't quite as indignifying. She stood up to Finn when she found out he took advantage of her affections for him in “The Rhodes Not Taken;” she broke up with Puck because she realized they wanted other people; and she apologized to Will for being momentarily but intensely infatuated with him. She stood up to Finn again in “Hell-O,” knowing exactly what his issues were with their relationship and called him out on them. For the solid ton of sheer force with which Rachel fell head over heels, she seemed to make up for it by being surprisingly self-aware and self-respecting when pushed to a limit. But Season 2 Rachel has yet to reach this limit. In the wake of her breakup with Finn, she circles around him with the doggedness and frail emotions of desperation. To be fair, the show has identified, through Will’s conversation with Shelby in “Theatricality,” as well as through experience, that Rachel is emotionally fragile - and that’s valid. But in favor of good storytelling, there comes a point when our main character has to pick herself up by her bootstraps and move forward. She should be sympathetic, yes - but not to the point of sheer pity. Suzy Pepper tells us so: Rachel is not meant to be love’s fool. She has too much gumption in the other aspects of her life, and Rachel even says so herself in “The Rhodes Not Taken” - her dreams are bigger than that. Rachel-in-love should not mean the sacrifice of that unique blend of forthright ambition and self-awareness, and unfortunately, the writers are having a hard time striking that balance. Part of the problem as well is that we rarely bear witness to Rachel happy in a relationship. We see glimpses here and there, in the background and in our periphery, but the bulk of the screentime given to Rachel’s romances is rather angsty. Her relationship with Jesse bore the weight of him originally being a rival and imploded unexpectedly over an argument; her infatuation with Will lead us to the conclusion that Rachel’s self-worth is low and sense of fantasy high; her brief fling with Puck ended with him insulting her; and her relationship with Finn manifested itself in a lot of self-esteem issues and petty arguments that ultimately resulted in the romance’s destruction. It’s hard to want Rachel to be in a relationship when this is the result. It’s almost as though the writers are attempting to hold up the tragic part of Rachel as a main character, and maneuvering her into relationships that are ultimately unfulfilling of her arc. And that notion wouldn’t be so bad if Rachel weren’t repeatedly subjected to this - five different love interests! Five! If Rachel’s going to be in love again (and surely she will), the writers need to grace her with the self-respect and maturity that has escaped our dear heroine in Season 2. It’s imperative to the success of her relationships on the show, and if they try to give Rachel another romance without likewise blessing her with a little dignity, then it’s going to be a struggle to develop the relationship fairly and likeably. I know it’s not always easy for you, Rachel. And I know that there are some things about yourself that you think you’d like to change. But you should know that there is some boy out there that’s going to like you for everything you are - including those parts of you that even you don’t like. Those are going to be the things he likes the most. Oh, goodness. That, ladies and gentlemen, is the goal. To find someone for Rachel who will love her for all her faults instead of lashing out at her for them or making her feel guilty about them. And unfortunately, there really hasn’t been anyone that’s met that criteria entirely and still been a viable option for Rachel in terms of dating (sorry, Will and Blaine). While Jesse may have loved and accepted a lot of things about Rachel that others would not, their romance was treated as a relationship doomed to fail. Jesse-and-Rachel burned bright and flared out over the course of four episodes, completely turned to ash after seven, and was a wisp on the wind after nine. This is not to say the writers couldn’t successfully bring Jesse back into the picture, however. We’ll see where the show takes us in that regard. As for Puck, his relationship with Rachel has evolved intriguingly and frustratingly since their initial partnering in “Mash-Up.” The issue there is that the writers designed the characters to be an ill-conceived couple, but portrayed them as rather functionally compatible within the episode. And then they got caught up in a lot of “bad boy-good girl” ruckus that’s really rather peripheral to the appeal of Puck and Rachel as a couple. Mostly, the writers insist on portraying “Puckleberry” in antithesis to “Finchel,” as a roll-in-the-hay type of fling composed of two incompatible people, and only dangle the prospect of their coupling as something not to take seriously. In actuality, Puck seems to genuinely like Rachel, and often seems capable of meeting the criteria in Will’s quote from “Ballad” - if only the writers were to develop it seriously. In the Finn exploration, I spoke about “The Finchel Construct,” which basically identifies that if Finn and Rachel are to be a successful couple, they need to embody their original purposes on the show: Finn must embrace his love for Rachel as something a part of him, and Rachel needs to be accepted for who she is without losing her identity. But Season 2 has turned the Finchel Construct into the Finchel Destruct, unfortunately. The way in which the writers choose to manifest Finn’s and Rachel’s insecurities leave something to be desired in terms of a healthy relationship. Rachel has been woefully insecure through much of her interaction with Finn, and to see her lose her spark on behalf of a boy is frustrating as a viewer. It takes away the headlining qualities with which we identify and relate to Rachel, in favor of a poorly-developed high school romance. Not good. The balance that is imperative in Rachel’s characterization goes completely out the window, as the writers lay the desperation on thick and remove the element of ambition and self-respect that helped make Rachel relatable to the audience. While it’s true that Rachel’s insecurities are definitely Rachel’s own issues, the idea that, in effect, they are often exacerbated in a relationship with Finn does not bode well for how fulfilling this romance can be in terms of either of their character arcs. This is not to say, of course, that the writers can’t set the dynamic so that it brings out each character’s good qualities. The point of Finn’s arc is to embrace, and the point of Rachel’s is to be embraced - but the writers are deliberately ignoring this and working against both characters’ development. So unfortunately, evidence points to the idea that when Rachel is hung up on Finn she is bogged-down with self-doubt, emotional dependence, and an inferiority complex - what can basically be identified as the destruct of Rachel’s core character. If the Finn-and-Rachel relationship is to be continued - and I wager to say that it’s meant to - this absolutely needs to amended so that Rachel as a character can be true to her original self, and cherished for it. 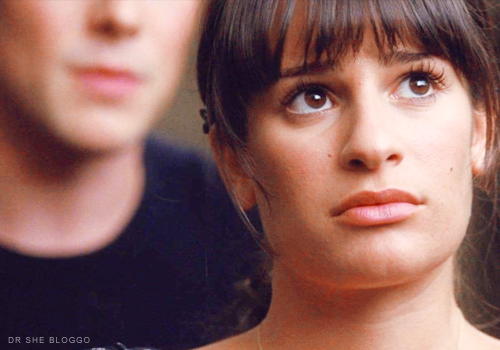 The Finchel Construct - or any relationship Rachel has, with anyone - is dependent on it. Another great analysis. The only quibble I have is with the notion that Rachel is emotionally fragile. I threw something at my TV when Will said it and again more recently when Finn said it. Rachel is the most emotionally RESILIENT character on the show. She gets knocked down harder and more often than anyone else (excluding Karofsky's persecution of Kurt), but she always gets back up. She never represses her emotions and rarely lies to herself about them, even in the wake of crushing rejections. Her uneven progress in bouncing back from her break-up with Finn is frustrating, but I'm not sure it's unrealistic even for Rachel. Intense emotional reactions are her norm. In life, as opposed to fiction, progress is sloppy and uneven. Even when someone finally achieves solid forward momentum, it's more like a spiral than a straight line. It's frustrating in real life and even more so in fiction where the rule seems to be the first epiphany is the charm. I've had to remind myself of this when I want to smack Finn, too. What role do you think the recent storyline of Finn encouraging Rachel to expand her talents into songwriting and acting as a sounding board for her efforts plays in the overall Finchel Construct and the development of the Finchel relationship arc? Anonymous - thank you! I definitely see what you're saying about Rachel being emotionally fragile. I think I was trying to get across the point that while it's okay for Rachel to be vulnerable, the writers need to manifest the fact that she IS the most emotionally resilient on the show. To be honest, I am personally very weary of most post-break-up Finn/Rachel interactions. I want the writers to leave them alone for awhile. From a storytelling perspective, I don't want Finn to be the cheerleader for Rachel when honestly he is part of the reason she's so depressing right now. But I can see where it's good that Finn and Rachel should be friends again, and build back to a reunion - which I assume is going to happen. Finn being supportive of Rachel is definitely conducive to the Finchel Construct, but only on the stipulation that he is outwardly and unashamedly supportive. And truthfully, he's still not entirely consistent on that front. For me, I personally want the pair to have a little space so we can all forget the dramatic mess that was their romance and perhaps build again, properly and likeably - without damage to either character. Thanks for the feedback, and the comment! This is such amazing character analysis. Honestly, from the first time I saw her, I loved her and her attitude and her flaws. I could see where Finchel had it's moments but I honestly felt she was better with Puck; it seemed as though they brought out the best in each other, and thus the best relationship she's been in on this show compared to others( If you asked me).